In March 2017, Vivan Sundaram presented, with Ashish Raiadhyaksha, an installation and public art project in Mumbai’s CSMVS (re-presented now at the KNMA), titled Meanings of Failed Action: Insurrection '46, evoking the uprising of Royal Indian Navy sailors in Bombay in February 1946. The project proposes - through the oral testimonies of those who took part in, witnessed or were impacted by this spontaneous uprising at the cusp of political independence that was ruthlessly quelled - ways by which the subject of art may be defined by a history of political subjectivities. 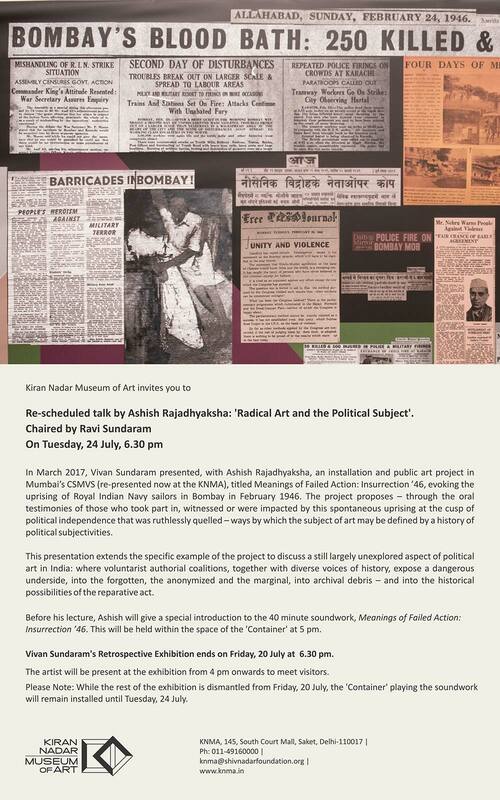 This presentation extends the specific example at the project to discuss a still largely unexplored aspect of political art in India: where voluntarist authorial coalitions, together with diverse voices of history, expose a dangerous underside, into the forgotten, the anonymized and the marginal, into archival debris - and into the historical possibilities of the reparative act. Insurrection ’46. This will be held within the space of the 'Container' at 5 pm. Vivan Sundaram's Retrospective Exhibition ends on Friday, 20 July at 6.30 pm. The artist will be present at the exhibition from 4 pm onwards to meet visitors.